Since I am on vacation this week, I asked a couple friends of mine to guest post here on A Spectacled Owl. Barbara, owner of Chase The Star, asked me what post I’d like for her to share. I thought about it awhile & realized I would love for her to share the first post I ever read on her blog. She wrote this post in June of 2012 and I remember bookmarking it, showing it to my husband Daniel, pinning it…pretty much everything because I love it so much. Barbara has been wonderful enough to share this with you all & I can’t thank her enough. Please make sure to check out her site, Chase The Star & you can also find her on Facebook, Twitter, Google+ & Pinterest. Over the weekend I was at Home Depot getting some supplies for a paint project I was working on. In the paint supplies aisle I remembered a few pins for DIY curtains I’d seen. You know the cloth you throw on the floor to catch drips and messes? It’s actually made out of lovely canvas that when hung up looks like linen! They come in various sizes, I chose the 9×6’s. At under $10 each, I just couldn’t pass them up. I mean if I mess up, I can always use them as actual drop cloths, right?! They come already hemmed (yes! ), so I just threw them in the wash and ironed them (not fun, but for only $10, totally worth it). I bought some clips at Target for $5 a pack (2 packs). They didn’t have silver to match the rod I have, and my impatience got the best of me (as always), so I got brown ones and sprayed them in silver with paint I already had. Laid them out, sprayed, after they dried, flipped them over and painted the other side. I wanted them to look a little more ‘custom’, so I folded the top down 15″ and created a faux ‘valance’ to sort of frame them. They’re 9 ft. in height so there is plenty of room to experiment! I chose not to add any embellishments because I like the simplicity they offer as-is for my particular space. However, you can certainly sew on some trim, or even paint a nice pattern (it’s canvas! ), the possibilities are endless! I love my new drop cloth curtains! I plan on getting more for the kid’s playroom (which you can see a little of there beyond my living room), and getting more creative with those. Can’t wait! 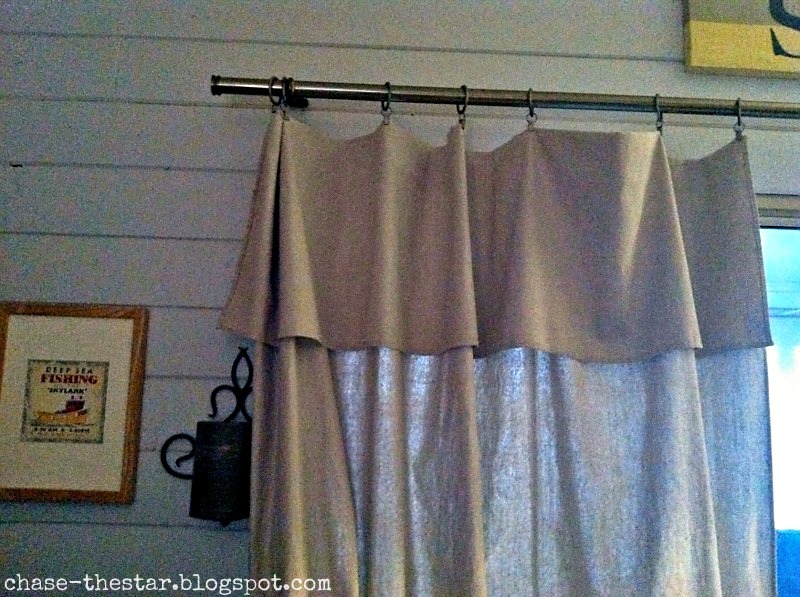 Drop clothes make great and very inexpensive drapes. This is really creative, not only are they inexpensive but they look beautiful. This is something I will consider the next time I have to replace my drapes. I didn’t know about these being sold at home depot. I don’t paint much. These are beautiful canvas material & a great idea! Thanks! 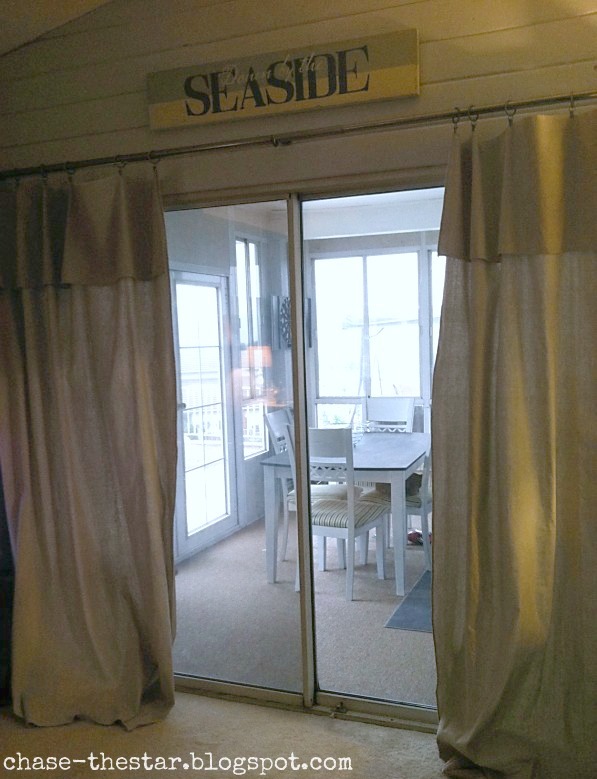 this is such a great ideal..the drapes look nice..thank you for sharing. What a great idea!!!! And cheap too. we are painting the living room right now and this is an awesome idea. I think I will try this. Cheap and looks great. Thanks for the tip! I am not crafty at all but this is something that looks easy enough. I might try it for my “man cave” (well the husbands) because I love the rustic look! This is a great idea. I am so glad you included pictures to where I could see what it actually looks like. these are too cute. I made ours from sheets and they turned out great. I’ve seen it done with sheets too & it’s so cute!